- "We get very positive feedback from other people who have seen our house and most think it's a fun idea"
The family of Daag- Cannert had renovated several houses themselves since the 1970s. 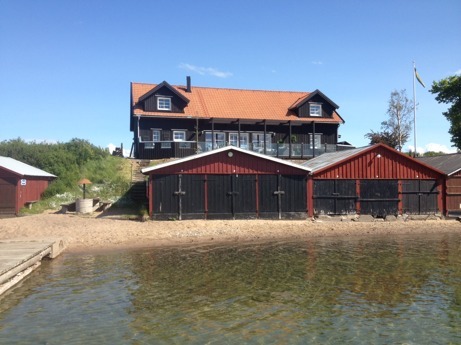 Now they had bought a house in Visingsö, which they tear down to be able to build a new house that was influenced by their personal wishes and preferences. 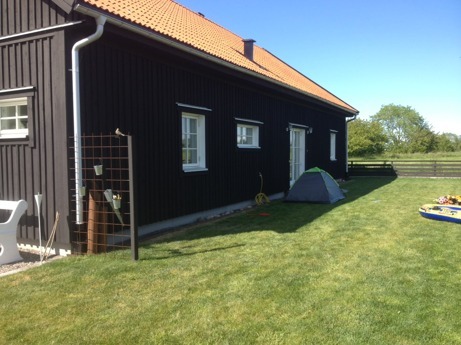 Below is a text in which the family explains why they chose an ecological building kit from Bosum building system, and why they recommend others to build their house in the same way. 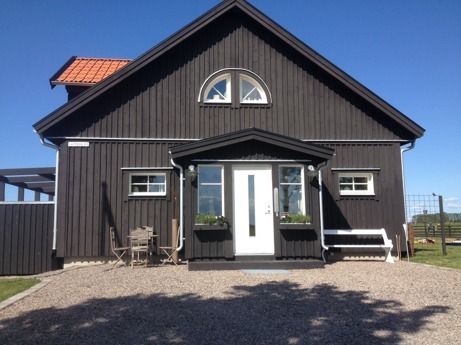 - We like the looks of a "Skånelänga" and wanted our future house to have that design. After a bit of searching online we found the company Bosum building system and their building kits in massive wood. We felt that the construction method seemed smart because of the thick walls, the construction would quickly be covered and that the material was wood and came from one manufacturer only. Then we sat down and made a sketch of our dream house and then contacted company representatives and presented our material. They offered us to come down to Skåne to witness an ongoing construction. We got a good impression of the company and their products, which resulted in that we decided to build our house with a kit from Bosum Building System. - Since we have renovated house since the 1970s, we already had a basic knowledge about house construction, but we had the never built a house from scratch. When the kit arrived, it took us only about 14 hours to put the walls up. We then chose to have traditional walls inside the house, which in hindsight was a good decision if we would like to move a wall in the future. We have only good things to say about the kit. 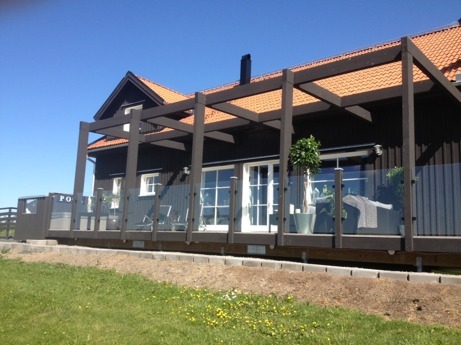 We chose to insulate the walls generously, which combined with the massive wooden frame gives an annual heating and electricity consumption of about 8000 kWh spread over about 200 square meters. 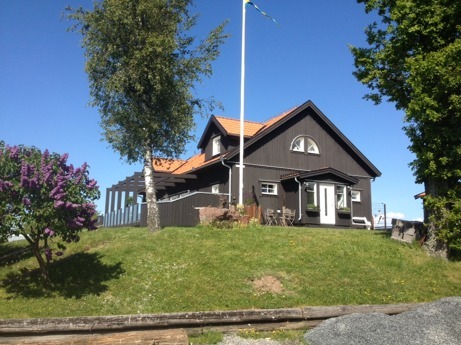 The wind is often strong and hard out here on Visingsö but it is not as noticeable inside of the house, it is silent. It feels very safe with massive walls and it's also not as flammable. Another positive attribute that the product contributes to is that you can highlight the fine wood surface and allow it to be without clothing inside, which we have done in some places. The indoor climate is very pleasant and it's nice and cool in summer and warm in the winter. - Now that the house is almost completely finished, we can conclude that we are tired and worn out by the project, which has been going on in parallel with full-time jobs, but we are also very excited and feel it has been both fun and educational. 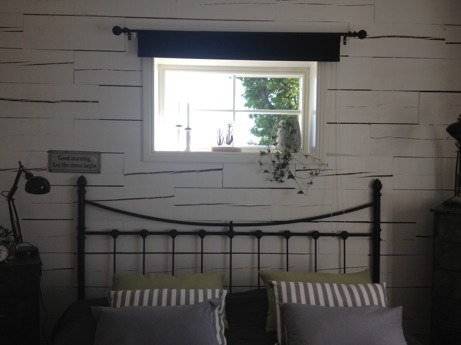 We get very positive feedback from other people who have seen our house and most think it's a fun idea. We have already recommended several other to build their houses with a kit from Bosum building system and will continue to do so.